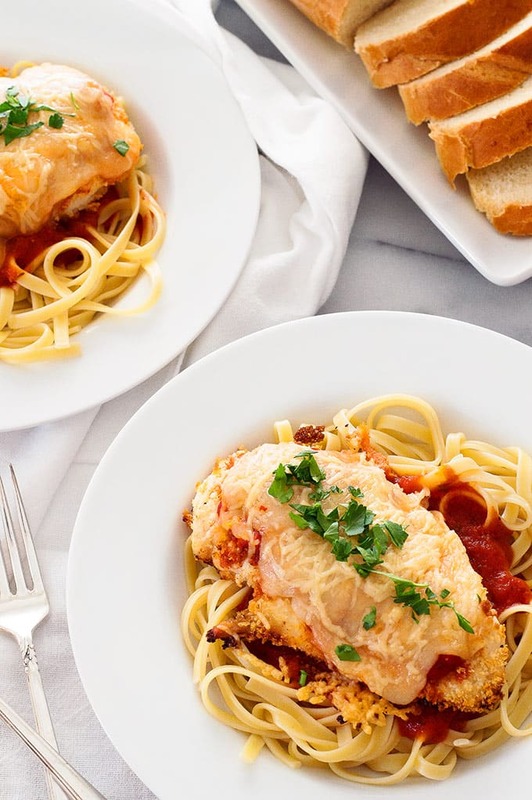 Quick and easy baked Chicken Parmesan for Two can be on your table in under half an hour and is a fantastic, filling weeknight meal when you have a craving for pasta. Sometimes eating healthy can feel like a drag. I love veggies. I love light, healthy meals, but there are days when all I want is to just bury my face in a plate of pasta. Who’s with me? When I feel like that, but still want to eat well, I whip my Easy Baked Chicken Parmesan (For Two!). 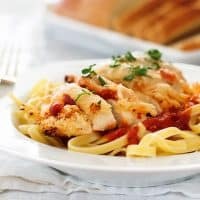 This dish is made with crispy, crunchy panko-coated boneless skinless chicken breast, served over fettuccine and topped with your favorite red sauce, cheese and more cheese. It’s filling, perfect for when you want some comfort food, and comes in at around 500 calories, including pasta, cheese, and all. 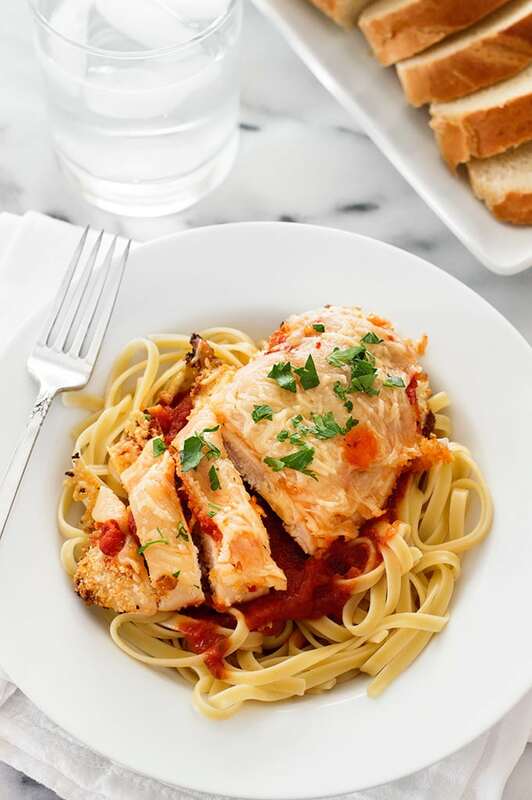 Plus, this baked Chicken Parmesan is fast, flexible, and EASY to make. If you are feeling ambitious, you can make your own red sauce, but if I don’t have a jar of homemade stuff in my fridge, I’ll usually just grab some store-bought spaghetti sauce out of my pantry. Whatever red sauce you use, this is going to be some A++ dining. And if you don’t stock panko (though you should, it’s like bread crumbs on steroids), you can use plain old bread crumbs to coat your chicken. Don’t you love a flexible dinner? Serve with a side of Butter and Garlic Green Beans or put some more panko to work with Panko and Parmesan Broccoli. Trust me, give this one a try. You are going to be shocked at how delicious and completely satisfying it is. As always, an instant-read thermometer* is the best way to make sure you get perfectly cooked chicken breasts every time. Bake just until internal temp reaches 160°F. They will reach 165°F during the five minute resting period. If you don’t have a kitchen scale, but want to make sure you’re not overdoing your carb intake, check out this article on how to measure pasta. Looking for panko at the grocery store? It should be in the same aisle as the breadcrumbs, right next to them. Preheat oven to 425°F and line a baking tray with foil. Grease well. Put a medium pot of lightly salted water on to boil for the pasta. 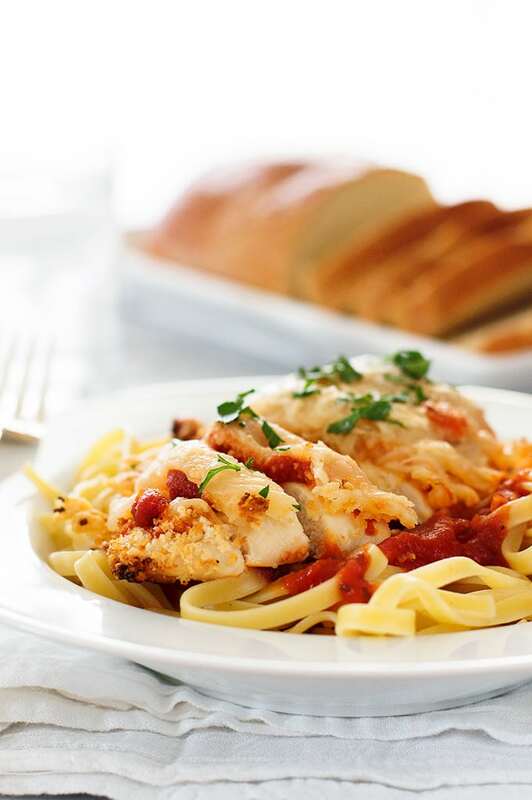 Take out two dishes large enough to fit a chicken breast. Add milk to one, panko to the second. Stir salt and pepper into the panko. Cut your chicken breast in half horizontally (butterfly the breast and cut all the way througby placing one hand on top of the breast and running the knife through the center of the meat so you have two even, thin pieces of chicken. Coat each first in milk and then panko and place on the prepared baking sheet. Bake for 10 minutes, or until meat reaches 150°F. While your chicken is cooking, heat sauce and cook your pasta according to package instructions. Once your chicken reaches 150°F, add a heaping spoonful (about two tablespoonof sauce over each breast and top with both cheeses. Return to the oven and bake until cheese is melted and chicken is cooked through and reaches 160°F, about 5 minutes. Remove chicken from the oven and allow to rest for 5 minutes. Plate noodles, top with the remaining sauce and serve chicken over the top. Enjoy!